Chinese New Year, also known as the Lunar New Year or the Spring Festival, boasting a history of more than 4,000 years, is the grandest and the most important festival for Chinese people. 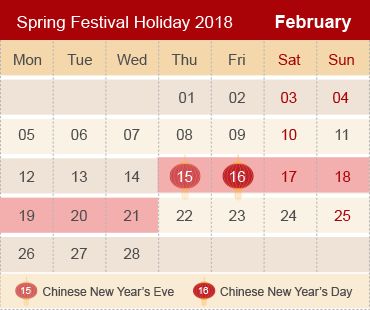 Normally, the public starts celebrating it from the New Year’s Eve (the last day of the 12th month on Chinese lunar calendar) till the Lantern Festival (the 15th day of the 1st lunar month). According to the Chinese ancient lunar calendar, this year is the Year of the Dog. It starts on Thursday on February 16th, 2018 and ends on February 4th, 2019, lasting for 354 days. The Hunan Government Website www.enghunan.gov.cn sincerely wishes all of you a prosperous Year of the Dog and a safe and merry spring festival!